Relief vents are designed to protect storage tanks from over pressure and allow product discharge without manually opening a cover. 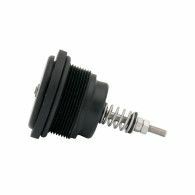 Patented designs incorporate a unique seal that allows the tank to maintain a positive pressure below the set pressure thereby protecting the tank contents from contamination. The vacuum relief feature is designed to increase discharge rate and prevent tanks from deforming under negative tank pressures. These units were originally designed to provide accurate pressure in portable chemical storage tanks, but can be used in a wide variety of applications. The low profile design prevents impact damage in the field. For special feature requests, additional options or quotes, please contact customer service.